Grasshopper pose looks a bit like a game of pick-up sticks played with your limbs. A beautiful, but confusing game. I, for one, needed an instruction booklet before playing. Start with a playful spirit and a warm body. Option A: a few sun salutations, a few holds of chaturanga dandasana (knees down is ok) to sense the shoulderblades draw firmly onto your back, a broadening of the collarbones, and a buoyancy to the heads of the arm bones (i.e. aim to sustain them at or slightly above elbow height). Fingers wide, and pads pressing actively into the floor. Don’t forget your smiling muscles. Warm-up Option B: fierce dancing to the pop song you secretly love with nobody watching. Then, prepare your body more precisely. I curated a substantial sequence of preparatory poses for a reason: Grasshopper is a deep spinal twist, with end range motion of the upper hip into flexion, external rotation, and some abduction but with strong activation of your adductor (inner thigh) muscles. There’s a lot going on. Don’t short-change your body. – In seated, draw your left ankle toward your right sitting bone or into half lotus in the right hip crease. Bend your right knee until the foot is flat, lengthen through the spine with right arm reaching up and forward as you bow. If your right shoulder passes the shin, find a half or full bind. – With feet active, cross one ankle over the other knee, lining up your shins so that you see an even triangle of space between your thighs. If the top knee doesn’t go down, don’t force it. Place a block or blanket under any lifted knees for support and set your hands behind you. If they rest easily one over the other, feet peeking out beyond the edges of your knees, then slowly lean forward from the hips. – Hold 5-10 breaths, Repeat on the other side. 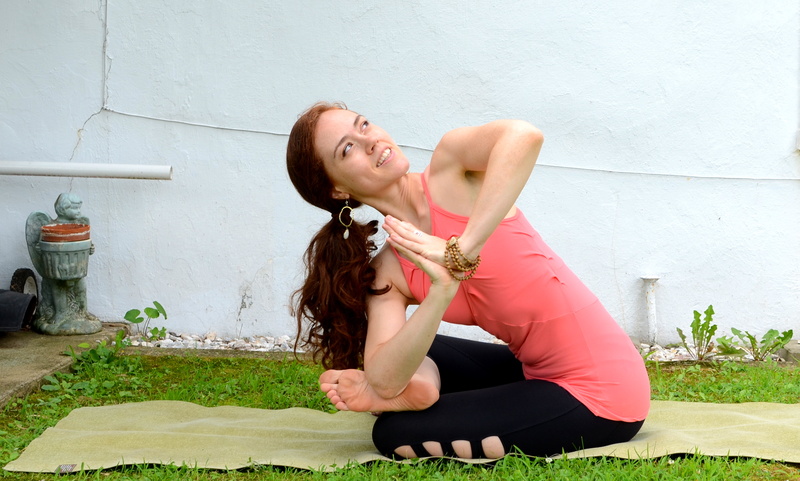 – From Fire Log Pose with the right ankle on top, bring your torso to a 45 degree angle and place your palms together in prayer hands (Anjali mudra). Initiating the action with your adbominal obliques, draw your right elbow to the arch of the top foot. Gently press the outer elbow into the sole of the foot in order to deepen the twist in the upper back, as well as create a deeper opening in the hip, prepping for Grasshopper. – This pose should feel more spacious than usual with all of the prep we have done. Hold the outer edge of your top foot with the same side arm, and draw that knee into the side of the ribs with your shin parallel to the floor. It is easy to drop into a rounded low back here. Instead, hug your navel in and up, brightening across the collarbones as well as the upper back, and pressing through the head. – Hold, happily, for 5-10 breaths on each side. – This pose begins to engage the isometric hold of the foot to the outer upper arm. Side your front shin to parallel with the front edge of your mat, keeping toes curling back toward your knee and your foot neutral (not supinated). I like to keep the back toes curled under so my back leg stays energized. – Initiate the twist from a lengthening of the spine, and – like in revolved fire log pose – same side elbow comes to the sole of the front foot. Palms press, heart beams upward, and shoulderblades stabilize to your upper back as you increase the pressure elbow to foot. – This action is now so familiar to you: lengthen spine to initiate the twist then draw elbow to opposite outer thigh. Check that the twist is from your spine, not your pelvis, by keeping knees even. Like we did in Fire Log Pose, draw one ankle over opposite knee with foot active and neutral and squat down. Hold 5-10 breaths on each side. From funky chair, we are very practiced in this act of placing the elbow to the sole of same side foot. Use your opposite hand as needed to bring the sole of the foot to the halfway mark or higher on your outer upper arm. You’ll need it! If palms pressing in this shape feels as easy as reciting the alphabet, open your arms laterally so that one hand touches the floor and the other arm reaches high to the sky. Find steadiness and openness here, but use this shape to progress into grasshopper. Glide your head forward. Don’t be afraid to kiss the ground before you fly. Deepen your squat to place your palms on the mat shoulder distance about 12 inches in away from your standing foot. Keep pressing your foot into your upper arm as you lean your body weight (option to rest the outer bent-knee leg on your arm as it bends) forward until it is easy to lift your lower leg off the floor. Stay here and revel in your feat, or beam the lower leg out across the horizon. 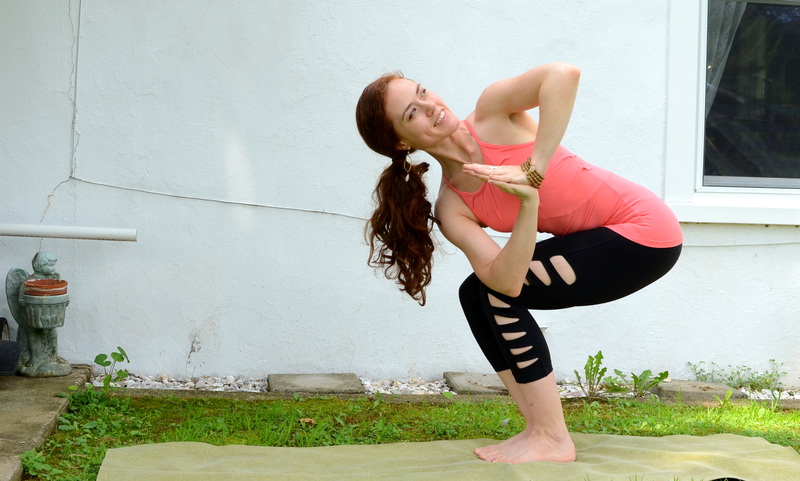 Smile, breathe, and, when ready to come out, aim to exit the way you entered the pose. Much thanks to Elise Foster for taking these photos and to the amazing Kiragrace for providing the outfit. Learned something? Let’s stay in touch! Once or twice a month I send out a newsletter covering the best of yoga, optimal health, yoga anatomy, physical therapy and share the occasional recipe, PLUS amazing upcoming events, like my retreats and yoga anatomy trainings.